DO YOU CARE ABOUT YOUNG BLACK LIVES? Just like America doesn't care about Trayvon Martin's death, they don't care about the deaths of black lives on the south side of Chicago. 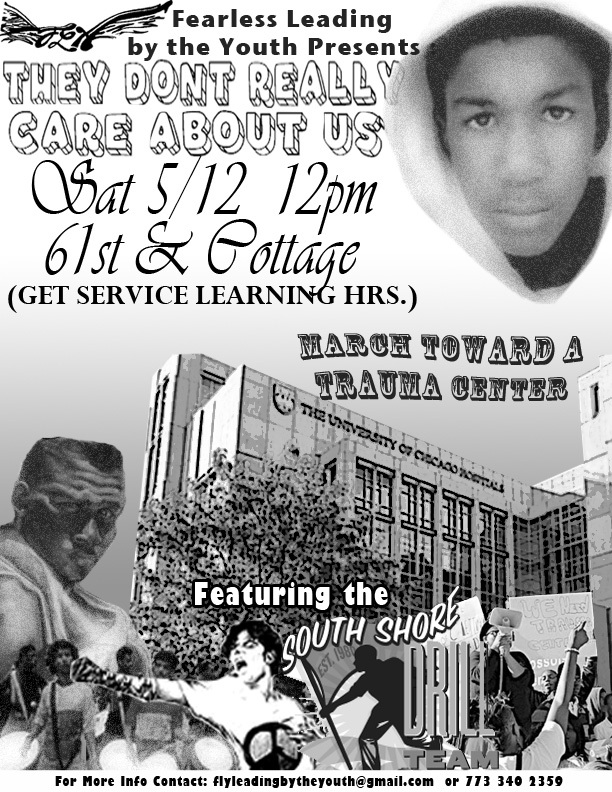 Did you know that there aren't any trauma centers on the south side of Chicago? YOU could be in a car accident or even shot on the south side and won't have access to immediate medical attention. 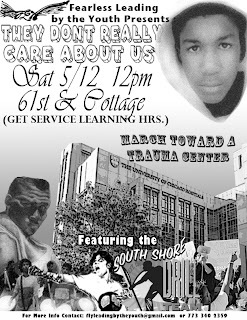 Come join FLY May 12, 2012 at 12pm on 61st and Cottage Grove to march to the University of Chicago Hospital to demand a trauma center. Get service learning hours!!! There will be a special performance by the South Shore Drill Team, drumming from the bucket boys and light refreshments will be provided. The University of Chicago is one of the richest most famous hospitals in the world but they won't treat us, they won't open a trauma center, they don't really care about us!